Even the boldest malbec is no match for this pocket-sized wine stain remover. White t-shirts, cotton couches, and vintage tablecloths rejoice! 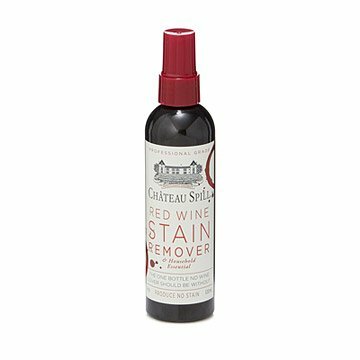 This red wine stain remover has come to save the day. Not only does this serum made from biodegradable surfactant work on old and new stains, it also makes stubborn berry juice, coffee, and other household spills disappear. This cleanser is safe on all colorfast washable fabrics, so you can bring out your "special occasion" table settings for everyday get-togethers without fear. Made by Harry Smail in Austin Texas. Work on heavy tannins, including beets, pomegranates, grass, blood, coffee, and berries. Works best on fresh stains before they've had a chance to set. Safe for colorfast washable fabrics. If you are unsure if your fabric is colorfast and washable, please test on hidden area first. Harry is a British-Kiwi, who moved to Austin from NYC because he married a Texan girl. The idea for the business started out of personal need. After one too many spills on his mothers Double Damask linen table cloth it was clear that her salt and white wine recipe clearly did not work and they always ended up with a dry cleaners bill. He looked at other products in the market and found them lacking. He also knew from working with big companies like P&G that he was not alone. Stain removal is a huge pain point for consumers who are desperate to have special treatments beyond what the big detergents can do. He is not a chemist but started researching what solutions existed and he found some surfactant based products that were being used in hospitals to remove stains from technicians hands. From here he set out on his own and, with the help of experts, came up with the ESR formula that powers Chateau Spill.